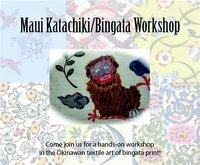 This event is presented by Ukwanshin Kabudan and the Maui Ryukyu Culture Group. jannysachie . Last modified Aug 27 2012 6:48 p.m.